A BAGGER and a snapper are set to don their hiking boots as they get set to embark on an adventure of a lifetime. 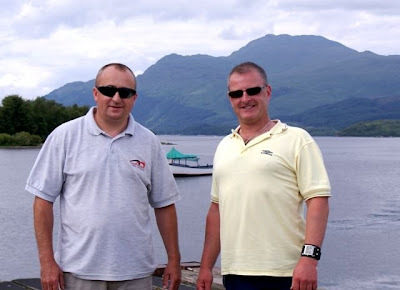 Pals Jock Tannock and John Dewar (pictured above) plan to conquer Scotland’s Munros during the next 12 months. Preparations to tackle each of the 283 peaks over 3000ft are at an advanced stage, with an array of camping equipment at the ready. Only one of the lads, both from Kilmaurs, has climbed a Munro before but they are confident of achieving the ambitious goal. And despite the recession the local businessmen reckon the only way is up...and up. Jock, 46, said: “It’s something I’ve intended doing since I climbed Ben Cruachan as a 14-year-old boy. The idea to tackle Sir Hugh Munro’s list of the country’s highest mountains materialised thanks to the pair setting up their own businesses. Photographs from the duo’s exploits will feature on the image galleries of Jock’s munro-bagger.com and John’s Fotografia UK websites. People who successfully scale a Munro can order mementos such as t-shirts, caps and other merchandise online to recognise his or her feat. Munro-bagger.com is also arranging organised walks and sponsored charity events, including a practice hike from Shiel Bridge to Glen Affric in a bid raise fitness levels for the maiden Munro. “Ben Lomond will be our first climb sometime during the next few weeks. If all goes well we’ll finish with Ben Hope in Sutherland,” said Jock. There are currently 733 Ayrshire business stories permanently archived on this site. To locate those of most interest to you, please use the site search facility in the top left hand corner of this page. Type your search term in the white box, then click the magnifying glass symbol.